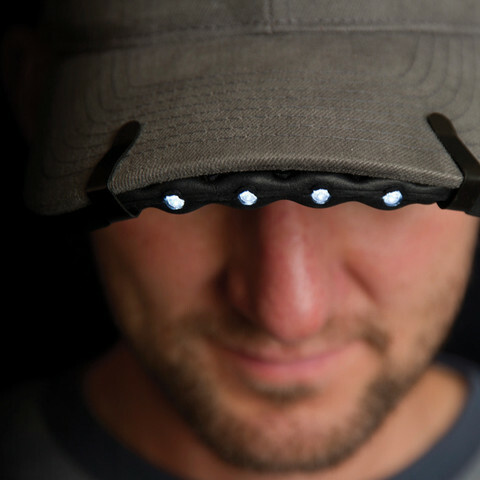 Here is a description from their website: “Flexible and lightweight, the Nite Ize BrimLit is a convenient, LED-powered hands-free light that clips easily and securely onto nearly any hat, cap, or visor brim. Formed from high-density EVA foam, the BrimLit slides underneath your hat’s brim and easily accommodates its shape. Its two spring-tension clips automatically adjust to the brim’s thickness, and a quick press of the button activates the BrimLit’s four LED bulbs—choose high mode for more directed light or low mode for glow. Perfect for illuminating outdoor nighttime/early morning tasks around the campsite, in garage, hunting or fishing while keeping your hands free, as well as hard-to-reach jobs under cabinets and in a tight crawl space. Powered by two fully replaceable lithium batteries (included)”. Available with 4 bright White LED lights. Update – As of 4/24/17 these lights are no longer available, but look below to find similar products. When I hear “LED” I think of an HD Tv, haha Headlights for sailing at night seems pretty important, Once those break you need to replace that. I think their a boating law for that, at least with a car if a headlight or taillight goes out you must replace it or you can`t drive with it!